The Chinese zodiac ox-snake compatibility is good enough for them to make a decent couple together. Are they too different to make it work long-term? Can their differences cause more problems or will they help bring them together? Will the Ox and Snake relationship require hard work or will they find it easy to be together? These two Chinese zodiac signs might seem very different to others but they actually work pretty well together. The ox and the snake actually share comparable temperaments. They like seeing quality and intelligence rather than something like quantity and ostentatiousness. Both of these signs is able to be very diligent. Both the ox and the snake are discerning and will feel as if they made an excellent decision in choosing each other as a soulmate. They both can be quite humble. The ox and snake in love will have similar views and goals. When these two are together, their individual sense of strength will join together to make their relationship even stronger and more formidable than either the ox or the snake are alone. The snake needs to take steps to accept that the ox will be one to be trusted. When the Ox is dating a Snake, they will find that they are able to both encourage each other and comfort each other in whatever comes their way. In a Ox Snake friendship, they can very easily count on one another. It will be very natural for them to be content together. They are not likely to have many issues, as they find each other very agreeable. In this Chinese zodiac compatibility both appreciate family. They both desire a domestic life that is durable, stability, and contentment. Very daring people might see the marriage of the ox and the snake as being sort of monotonous. The ox and the snake love compatibility has a lot of intensity. Even in bed, the Ox and Snake sexually make great partners. Each understands the other’s needs and desires without being told. The snake is captivating and attractive. They have a smart intuition. The ox is stable, honest and might be broken out of their shell by the snake because of these traits. However, at the same time the snake will be able to understand and welcome the ox’s adoration of home, family, and warmth. They find the Snakes appealing and are drawn to their tendency to be philosophical. Both the ox man and snake woman could actually learn quite a bit from one another. They each have unique viewpoints when looking at things out in the world. The snake man appreciates material things and respects the ox female. The Oxen grant the snake the things they desire. They find them nice and attentive. Both of these Chinese zodiac signs will actually work nicely together. The ox male will want reassurance from his snake female partner. If the snake feels jealous then they might provoke an argument with the ox, but the ox is stable and will find it easy to reassure the snake. The Ox snake break up will only be caused when the snake becomes a little clingy and envious if they think they have the smallest cause to be. The ox woman is a good one to place trust in and because of this and with the male snake recognizing this the snake can refrain from feeling a lack of security in their relationship. 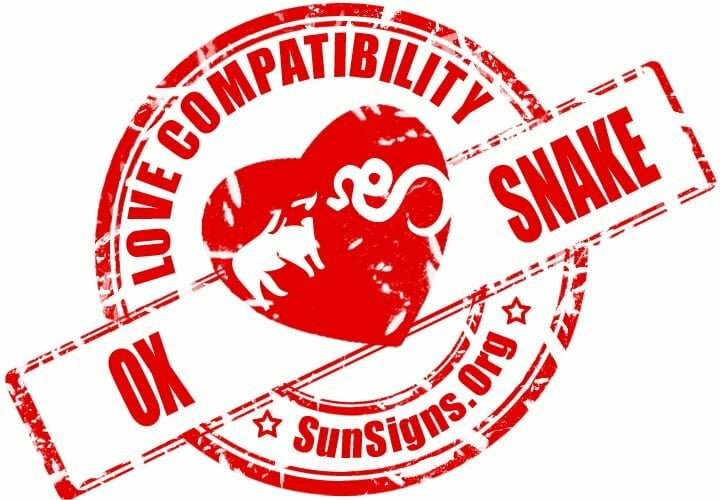 Ox & Snake Chinese Horoscope Compatibility Rated 4 Hearts!